Athey house the way it was. This is the Benjamin Athey house. Those pictured are probably Benjamin and his wife Isabelle (Farmer) Athey. They were married 26 Nov 1876 in Oregon City. He arrived Oregon July 1852. His DLC# [Donation Land Claim] 4780 was settled 1 June 1854. Herb Bumgarner, 635-4845. PS. Benjamin's DLC adjoined that of his brother, Mathew, Benjamin was born 1832 Wood Co., VA now WV. Description Negative is with photo. Benjamin Athey is buried in the Robert Brid Cemetery in Stafford and his donation land claim is listed as Washington/Clackamas County. Transcription Athey house the way it was. This is the Benjamin Athey house. Those pictured are probably Benjamin and his wife Isabelle (Farmer) Athey. 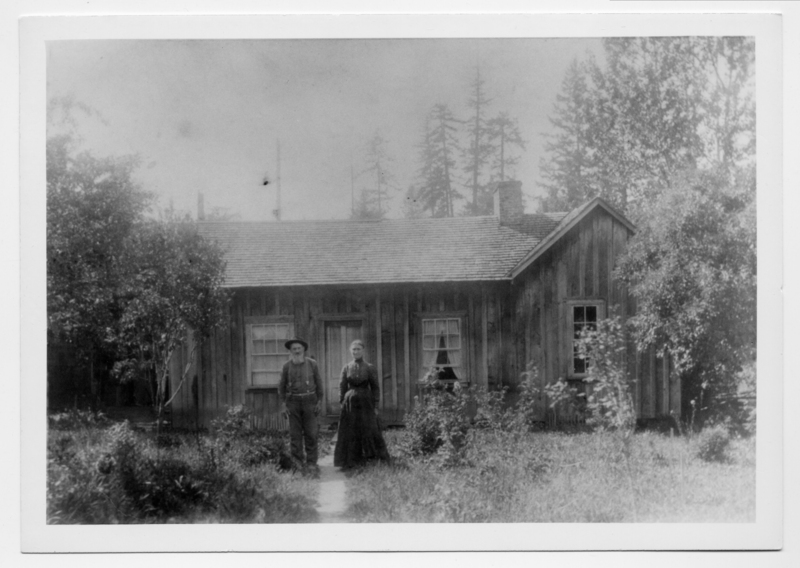 They were married 26 Nov 1876 in Oregon City. He arrived Oregon July 1852. His DLC# [Donation Land Claim] 4780 was settled 1 June 1854. Herb Bumgarner, 635-4845. PS. Benjamin's DLC adjoined that of his brother, Mathew, Benjamin was born 1832 Wood Co., VA now WV.